Blessed art Thou, O Lord, teach me Thy statues. The assembly of angels was amazed beholding Thee number among the dead, yet, O Savior, destroying the stronghold of death, and with Thyself raising up Adam, and freeing all from hades. Why mingle ye myrrh with tears of pity, O ye women disciples? Thus the radiant angle within the tomb addressed the myrrh-bearing women; behold the tomb and understand for the Savior is risen from the tomb. Very early, the myrrh-bearing women hastened unto Thy tomb, lamenting, but the angle stood before them and said: The time for lamentation is passed, weep not, but tell the Resurrection to the apostles. 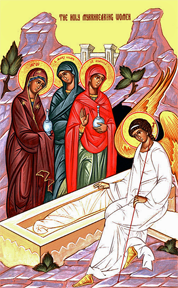 The myrrh-bearing women, with myrrh came to Thy tomb, O Savior, bewailing, but the angel addressed them saying: why number ye the living among the dead, for as God He is risen from the tomb. Let us worship the Father, and His son, and the Holy Spirit, the Holy Trinity, one in essence, crying with the Seraphim: Holy, Holy, Holy art Thou, O Lord. In bringing forth the Giver of life, thou has delivered Adam from sin, O Virgin, and hast brought joy to Eve instead of sorrow; and those fallen from life have thereunto been restored by Him Who was incarnate, God and man.